Dr. Emilie Marcus, CEO of Cell Press and Editor-in-Chief of Cell, shares her thoughts as one of Elsevier's leaders and role models. From my initial interest in science in high school, I never felt held back, overlooked or under-appreciated because I’m female. Quite the opposite: Perhaps because people in science often are so passionate about their work, they may be gender-blinded by the thrill of sharing their fascination and wish to encourage anyone who is interested. And I was. My thrall with science began with thoughts of becoming a physician. That goal changed after a year off after college when I worked in the Columbia University lab of the eminent neurobiologist Eric Kandel (who went on to share the 2000 Nobel Prize in Physiology or Medicine for his research on the physiological basis of memory storage in neurons). Dr. Kandel and his colleagues were so encouraging that they inspired me to pursue a career in scientific research rather than medicine. That led to successful graduate and postdoctoral research work, including a PhD at Yale in biology/neuroscience (where I had an excellent mentor, Dr. Thomas Carew) and research positions at the Salk Institute and University of California at San Diego. My path was set. And I had a lot of support from both men and women in science – and owe them a lot. But a funny thing happened along the way: Despite loving research in all its aspects, I became unsettled by the choices necessary to pursue a career in academic science. First and formost, you must select one specific area of focus. That requires a measure of healthy chauvinism, a conviction that your chosen question and approach are more interesting, valuable, compelling and likely to succeed than others. But as much as the scientific problems I was working on were enjoyable and inspiring, equally (and sometimes more) engaging and exciting were the projects and results of other scientists. The need to choose a single focus area, in fact, panicked me. This culminated in a pivotal, life-changing experience when, as a post-doc, I received a phone call with good news about funding of my grant application and realized I was more depressed than elated. If a research scientist is not ecstatic about the rare positive news about funding, it is most definitely a sign not to ignore. After much soul-searching, I decided to leave research and began looking for career opportunities where my breadth of interest would be an asset. An ad for an editorial position at the scientific journal Neuron led me to publishing and eventually the position of editor-in-chief. Work as an editor satisfied every need to remain deeply engaged with science and scientists while indulging in broader scientific issues. My new path led to my leadership today of Cell and Cell Press. Again, all the while I was encouraged – or at least never discouraged – by male and female managers, mentors and colleagues. All that said, throughout my professional experiences, from the lab to Cell Press, I have often found myself in the minority – sometimes a minority of one. The only woman. The only junior scientist or editor in a room of distinguished leaders. The only American in a room of Europeans. The only academic in a room of business people. More recently, the only business-minded person in a room of academics. In all of these cases, effective discussion, successful collaboration, and recognition of the value of my contributions, always required a good deal of listening and asking questions, putting myself in others’ shoes and cogently explaining my perspective and ideas. Closing a “gap,” I’ve found – gender or otherwise – requires mutual respect, shared goals and a positive teamwork approach. Whether or not this attitude measurably contributed to my career success, it certainly made work more fun and rewarding. Why the gender gap in science? If my experience is illustrative, then it’s fair to ask, why is there a gender gap in science, especially at the advanced levels? 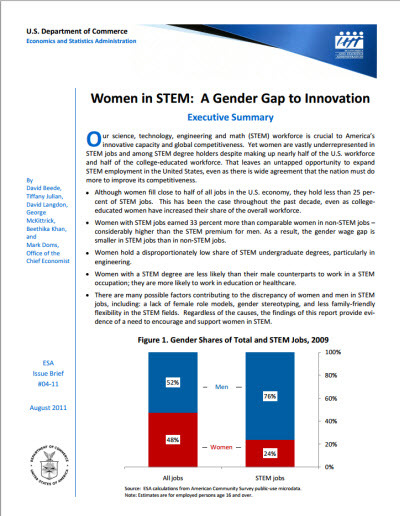 As a 2011 US Commerce Department report concludes, women remain vastly underrepresented in STEM-related jobs and among degree holders, and women with STEM degrees are less likely to work in STEM jobs, even though the gender wage gap is smaller than in non-STEM jobs. What’s going on here? Let me suggest a perhaps provocative factor, that the gap is driven by the unusually individualized and competitive nature of academic research. Science trains far more students and post-docs than the number of faculty positions that are available. Growth in government research funding in many countries is limited. Thus, the field is sharply competitive for grant dollars, faculty positions and stature, and it tends to reward individual over team achievement (no ambitious post-doc ever got a grant or job because they were a good team player or helped another scientist get a key publication). Moreover, no formalized structure tells a scientist what question to work on, approach to take, or how many hours to invest. No principal investigator I know ever told a post-doc that he or she really should take a vacation. Right or wrong, these factors are the reality of academic science today and how scientists are rewarded and advance. Those who stand out and rise above tend to work long days, nights and weekends, often traveling and presenting constantly. It can be hard for someone who wants a diversified life to compete against someone who’s willing to be in the lab 20 hours a day or on the road for months. As a result, devotion to research science and pursuing the highest achievement makes seeking a work-life balance (e.g., family time) especially difficult, as is true in many competitive fields. The unique demands of research science exacerbate the challenge. The individualized nature makes it harder for parents and employers to distribute the workload when family duties call. What’s more, in my experience – forgive me – men still tend to be more comfortable with forgoing family time for work. Because the field is so competitive and fast-moving, women who take time for family can lose ground quickly. So to me, the gender gap is not necessarily a gender issue. That is not to declare the field completely free of gender or other biases – overt or covert – that should be addressed as they occur. Some of my colleagues note other challenges and solutions, including the need for women scientists to serve as role models to inspire young women to follow in their footsteps or mentor young professionals. On a separate front, many institutions are striving to retain talent by helping both women and men balance work and life. Policymakers and advocates are calling for more generous family leave measures in the United States that other countries have. And many women and men I know do already achieve the balance they seek, and happily thrive on both sides of the scale. That’s my point: Scientists, like everyone else, understand that life is about making choices, accepting tradeoffs and adjusting expectations. Plenty of research scientists I know who do not wish to shortchange family life (or other endeavors) for this uniquely demanding field are realistic – they understand they also may not be on the fast-track for a Nobel Prize or heading a major research institution. They accept that, and are happy to adjust their goals carving out a successful, productive research career with a comfortable sustainable position in the marathon, but not aiming to be the first to cross the finish line. I hate to say it – and some might chafe at this notion – but a person who chooses work over other life pursuits may, by definition, do better in that field. That may not be the standard we wish to set. Science might be served better by a system that favors diversity, team work, balance, broad intellectualism, civic responsibility and healthy work life balance. If so, then collectively we need to embrace and pursue that goal with measures for both men and women that foster and reward those attributes in gaining funding, jobs and status. Update: A similar version of this article has been published in Issues in Science & Technology, a publication of the National Academy of Sciences, the National Academy of Engineering, the Institute of Medicine and the University of Texas at Dallas. Great post. 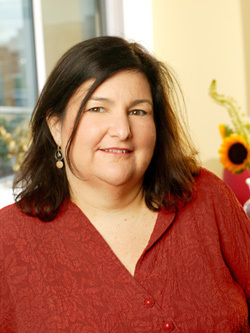 The Association for Women in Science (AWIS) was awarded a three-year grant from the Elsevier Foundation to develop and facilitate a work-life balance educational and support program for AWIS members. In the initial survey that was conducted in prior to the development of this program, almost 60% said their career path changed or they refused to accept a position or job because of work/life balance issues. I completely agree with Dr. Marcus that changes need to be made in order to promote a more healthy work-life balance for scientists in the future. The Women's Rights movement open the doors for women to have careers, including careers in science. But we still haven't figured how the roles that women traditionally held, like running the home and raising children, will be met. As a society, we need to figure out how to leverage the intellectual power of women without forcing an all or nothing commitment.